Last month I had reviewed Fotonica's Cell Phone Camera Lens Kit and disappointingly it turned out to be an unworthy buy (Rating= 1.5 / 5 ). Today I'll be reviewing the Selfie Stick from the same brand and let's see if it is worth trying. All due courtesy to rapidly developing mobile phone photography technology and social media networks, I don't think there'll be a single reader who would ask, "What is a selfie?" Whether you are a selfie lover or not, surely you know it what is a selfie, and how it is captured. If your cell phone has a front camera you must have taken a selfie, at least once in your phone's lifetime. 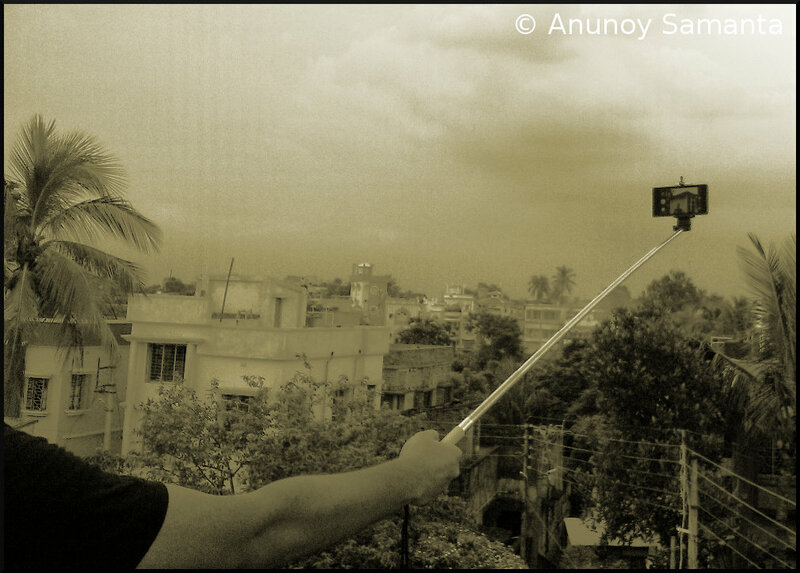 Selfies have bigger role than keeping selfie-holics busy. It is definitely a saving grace for solo wanderers to document their wandering. 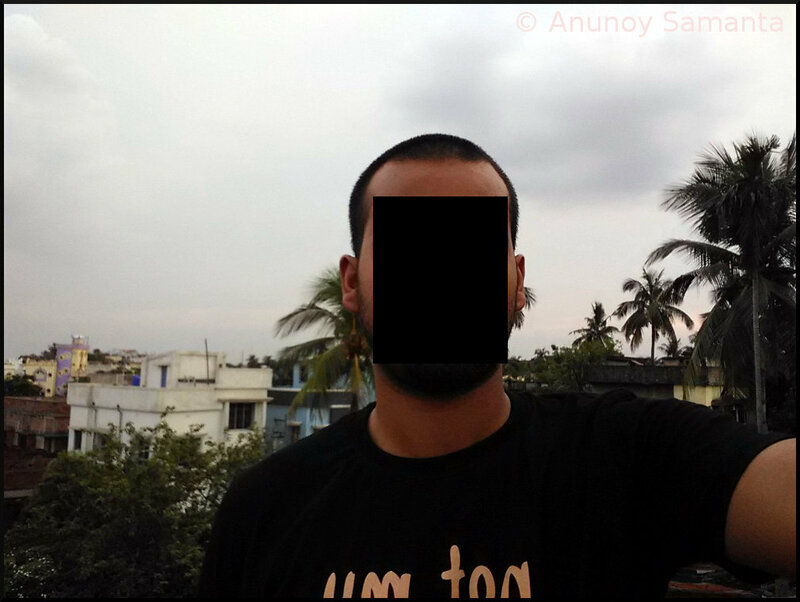 How many times while taking a group-selfie or capturing the beautiful background properly you wished you had longer arms? Yes, the lens of your mobile phone camera is simply not wide enough to capture a lot from such a small distance. Exactly in such situations a selfie stick comes handy! A selfie stick holds the camera few more feet away from your body so that a wider angle is achieved, while leaving the control of picture composition and shutter release in your grip. 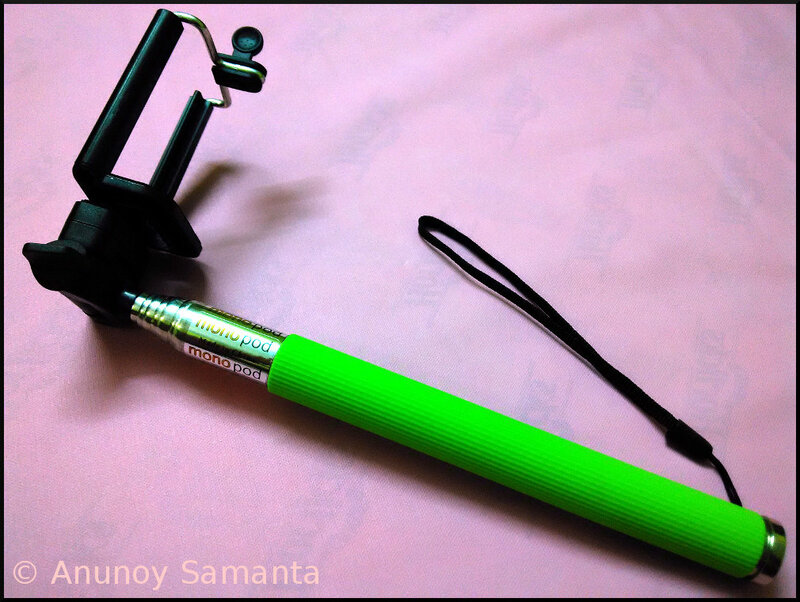 Fotonica's colorful selfie sticks available in various online stores at a price point of only 400-500 INR (below 10 USD!) are undoubtedly attractive, but question is- Do they really ease up capturing selfies? I've got the answer for you. The Good: Easy portability due to light weight and small size, Convenient design, Simple operation and an useful wireless remote for shutter release. The Bad: The mobile holder frame doesn't look assuring enough to clutch heavier mobile phones. 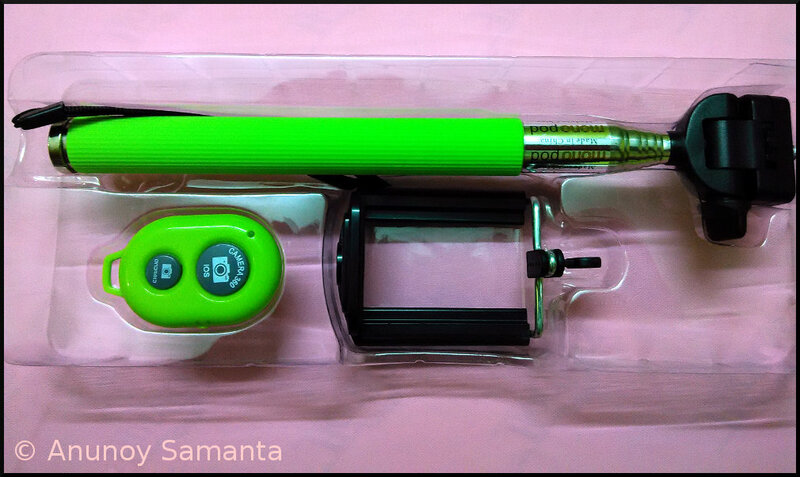 The Monopod, Mobile holder and the Wireless shutter remote (clockwise). You get Out of the Box: a Selfie Stick (Monopod), detachable Mobile Holder, Bluetooth Remote Shutter Release and a Lithium ion battery. Made up of aluminum alloy this selfie stick is quite light and compact. When folded it is less than 9 inches, but the same tiny thing on pulling extends up to a good length of 3.5 feet. The colorful grip material (available in different colors) is made up of foam and feels good to hold with an extended arm. The grip felt firm even in my sweaty palm and holding it tight in my fist was a sheer pleasure. Without the mobile holder attached, the retracted selfie stick seems more like a dependable gear for self defense in any close combat (Ah don't pick a fight now)! 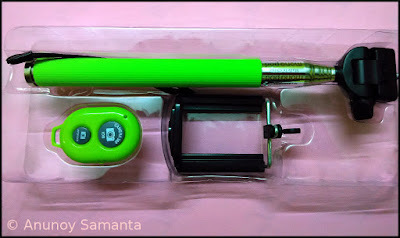 There is a wristlet at the proximal end of the monopod which offers additional safety for your beloved gadget in worst scenarios (if the nonslip grip betrays you by chance). The quick spin knob fits perfectly into its metallic socket on the mobile holder while the quick release clamp holds the mobile phone securely in a second, making the whole process of mounting so fast and butter smooth. By rotating the quick spin knob which controls the main mounting screw and twisting the thumb screw you can adjust the shooting angle to your satisfaction. Mobile holder frame attached to the retracted Monopod. The surprise chocolate-pie in the package, a petite bluetooth shutter remote is powered by a coin sized lithium battery and helps to capture selfie instantly at the flick of a button. The wireless remote has two buttons (one for Android and the other for iOS devices) and a power switch. As per the manufacturer, the remote has a range of 10 meters and, compatible with any device running on or above Android 3.0 and iOS 4.0 respectively. I didn't push its limit to check the range but it successfully paired with my phone (running on Android Jellybean) to return me few quick snaps with the press of its fast responsive 'android' button. The moment you switch on the remote your phone bluetooth will be able to detect it. As soon as you press on 'connect' your phone shall pair with the tiny shutter remote and you're free to experiment with remote selfie shooting. 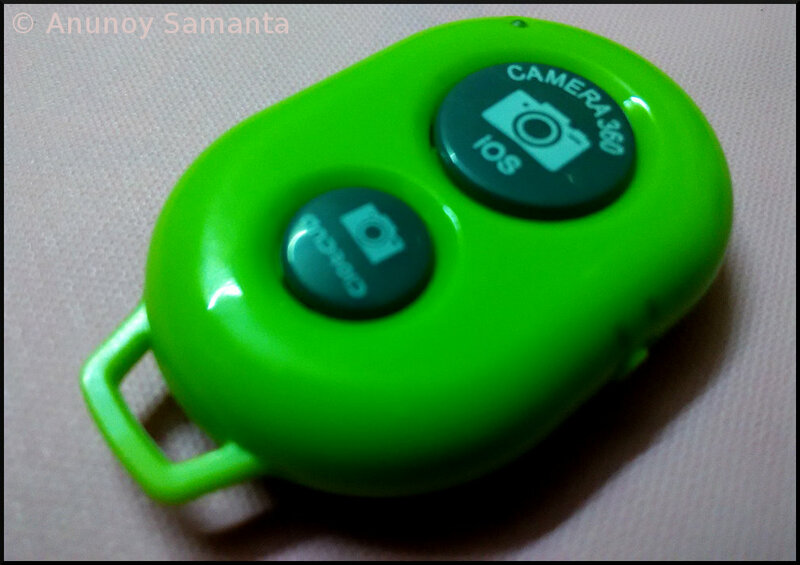 Bluetooth Shutter Remote is compatible with both iOS and Android devices. 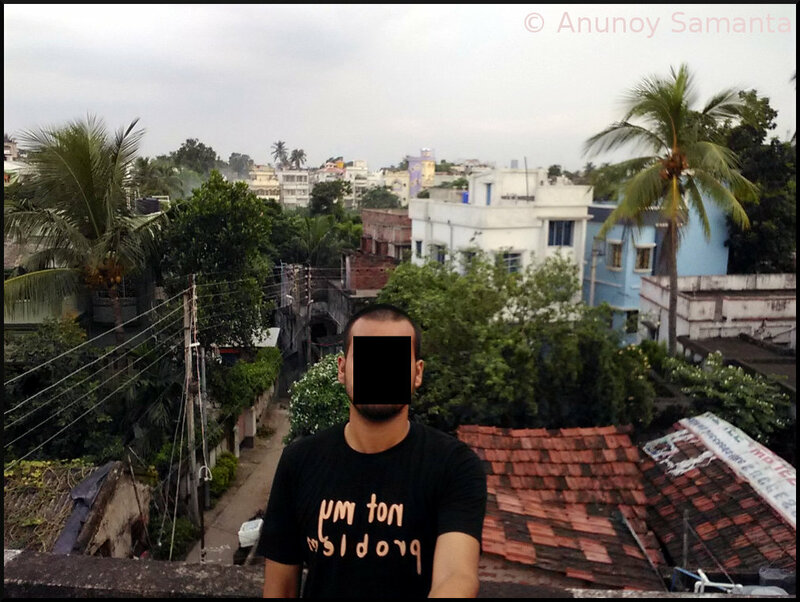 The mobile phone camera when fitted to the fully extended selfie stick, gave decent coverage of me as well as my backdrop. 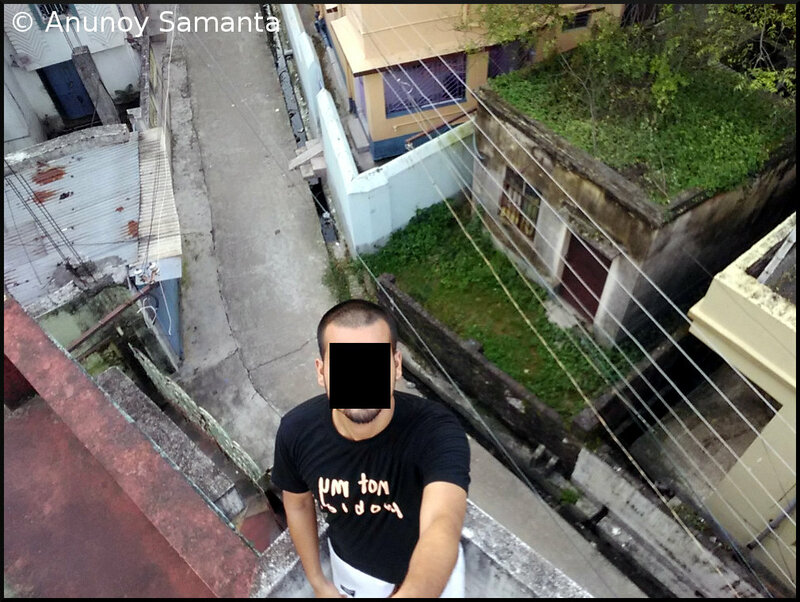 I tried few unusual angles of selfie taking (example- aerial shot) which couldn't have been possible otherwise. On holding the stick for few minutes the weight on its distal end (i.e. my phone) started to bother me. Mind it, the phone I was using for this review has a 4.7 inches display and certainly not among the heavier ones in the market. So, I realized that putting a bulkier phone, phablet or a tablet would not only make your hand shaky but also jeopardize the safety of your gadget. While trying the aerial composition, honestly I felt the stick wobbly. 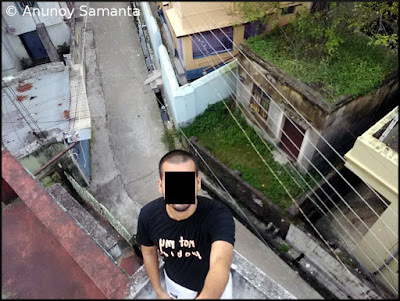 I do not think I'll have guts to extend my phone beyond the edge of a cliff when it is mounted over this selfie stick. The adjustable ball head could have been made more sturdy. Although this is no complaint, slight increase in the weight of the proximal end (grip portion) would have endowed this selfie stick with much more stability while capturing selfies. But, can't really blame Fotonica as they had to keep the net weight of the stick minimum. Forget about putting a tablet/iPad, do not think of putting your digital camera unless you want to show off the ultralight feature of your cam. Mobile phone selfie when taken without the selfie stick. Mobile phone selfie when taken with the selfie stick. The selfie stick gives flexibility to shoot from various angles! Final Words of Wisdom: The low price and fairly decent built quality make Fotonica's selfie stick a 'must have' for mobile phone photographers. While the portability factor gives it a space in your travel bag, the lack of sufficient stability makes it useless for you if you have a bulky cell phone. Till I change my phone, I'll keep it in my traveling backpack. Happy clicking folks and keep clicking photos on the go! there are 99% people who are into selfies and most of them own a selfie stick now a days. I checked the price of this device today on flipkart and for just 400 bucks..... I think this would be a steal. Yea, using ideas is always desirable till it becomes an act of copy-pasting.